I love to read and I've always loved books and used to buy them all the time. Around the time I bought my first home, I made a promise to myself that I wouldn't buy anymore hardback books except copies of first edition releases from two of my favorite authors. Why would I make such a promise? As I was packing my things to move from my very last rental apartment to move to my very first home I purchased, I realized just how many books I owned. It was excessive and I just did not have the room to store them anymore. It was difficult, but I decided to dontae nearly all of them to my local library and I kept only a small handful. Okay, maybe more than just a small handful - it was more like 3 boxes. Two were filled with cookbooks and one was filled with fiction hardbacks. I've always gotten library cards from every where I've lived. I just needed to utlizie my local library! A couple of years later, Amazon came out with their first Kindle device. I was intrigued, however I wasn't interested in purchasing one until after they came out with the Kindle 2. But it wasn't until after they came out with the Kindle 3 that I really wanted one. I finally broke down and bought my Kindle 3 in January of this year. Transitioning from books to my eReader was difficult at first. I loved my new electronic gadget, but I also love the feel of a book. I love the feel of the paper and turning each page one by one, seeing progress as I made my way to the end of a book. I only bought a few Kindle books and had downloaded many free books. 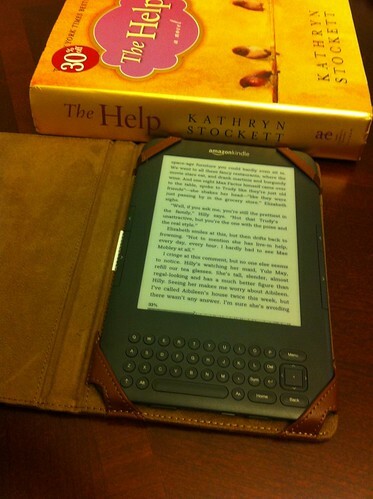 But more and more, I was getting used to my Kindle and loved how conveniently small it was. I loved that it would fit in my purse, no matter what book I was reading - not something I could do with thick, hardback books in the past. I also loved that it was so light-weight and so easy to travel with. My laptop bag wasn't weighed down with a heavy book for my frequent day trips to NYC for work anymore! And then one day, they introduced Kindle Library Lending and I was absolutely thrilled! I had borrowed a copy of The Help from my co-worker and I had gotten so used to my Kindle that I was too lazy to carry the thick book around. I had her book on my shelf for months, planning to read it one day... eventually. Two days after my library introduced Kindle lending, I put my name on the waitlist for the Kindle eBook copy of The Help and I was number 42! I paiently waited for weeks and finally last week I received an email that my name had finally made it to the top of the list! My library gave me 48 hours to check it out on their site and their Kindle eBook lending period is for 2 weeks. The book is so good, I can hardly put down my Kindle!! And, though I love the book and wished I had cracked open my co-workers hardback copy before now, I've got to admit that I'd still rather read it on my Kindle! Wow. Techology has changed the way I feel about reading. Do you have a Kindle? Or are you considering getting one? Hi! I actually found your blog because I was googling Erin Condren Life Planner reviews and saw you had posted about it. I ordered mine by the way and am waiting for it's arrival. However I was in the same situation as you were with getting a E-Reader or sticking to the paper books. It took me awhile but I finally did it and I couldn't be happier! Even if it's the sheer fact that now I don't have to lug around this big book it is a sleek device regardless how big or thick the book is. Plus sometimes if we love an easy read or a serious piece no one knows what you're reading which can be nice. I hope you enjoy! Please do not use any content from this blog without crediting me & linking to it directly. Powered by Blogger.